Armchair Linea with structure in solid walnut and seat in anthracite grey fabric. With other fabrics on request. 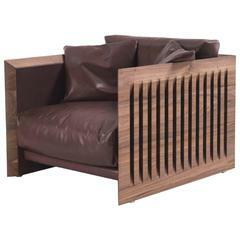 Armchair ray wood made in solid natural walnut wood and vertical slats "Ray". Genuine leather upholstery cushions stuffed with goose. Finish with natural wax and pine extracts. 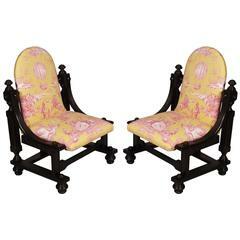 Armchair Wooden Rings all in solid hand carved mahogany wood. In ebony finish. Each piece is unique as it is a hand-crafted work. 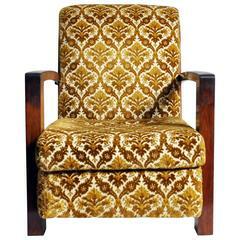 This handsome chair is from Budapest, Hungary and is made from solid walnut, circa 1940. It features clean lines and will eventually be reupholstered. Beautiful Biedermeier armchair from Germany, very good restorated condition. Solid walnut wood and completely new upholstered. Measures: Seat height 43 cm. 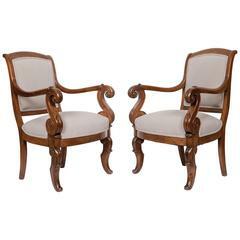 Biedermeier armchair from Germany, very good restorated condition, solid walnut. The feet are with brass shoes. The Rondine is an armchair made in hand sculpted solid American walnut in four finish options with the seat and back-rest upholstered in fabric, leather or natural leather.